All I/O pins on the board. And descriptions..? This photo show's the Pass through board(s) installed in there proper orientation for external motor drivers (HIGH POWER motor controllers like Gecko's). In the photo belowthe external driver boards pass the dir/step/en signals to the green sockets as shown. The 1 and 2 pin JPC jumpers labled x-y-z-a step/dir and EN (enable) all pass there signal to their axis. Enable is linked (parallel) to all enable headers. I soldered headers to my board in red. The red jpc connectors locations can be used instead of the ext driver board adapters and the green connectors if needed. I do not know if the protoneer step/dir enable are active HIGH or active LOW. If someone could answer that, that would be great. As to the pass though boards so we can use the green connectors. I do not know if they are active high or active low if someone could answer that question it would be great. JUST REMEMBER these are 2mm not 2.5mm like standard PERF board. they will fit standard perf board but you have to bend the pins a little. On the board there are 3 headers A4 A6 AND A7. What are these pins for? On my board in the photo I have colored Black and Red showing all ground pins and high power +v pin. When the board is being used as a pass though with no on board motor drivers. If a POLOLU board is being used then the pinouts for the motor connectors changes to a+ a- b+ b- I do knot the exact connection as I have not found that info. if anyone knows and or could post a photo sowing it that would be great. Last edited by berin on Tue Feb 12, 2019 2:36 pm, edited 3 times in total. Re: All I/O pins on the board. And descriptions..? Those are pin GRBL don't use. 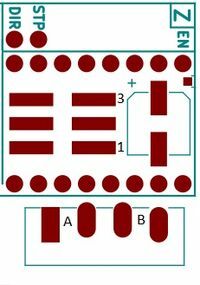 A6 and A7 are available on Arduino Nano boards but not on Arduino Uno boards. + and - does not really matter as it will just change the direction the motor moves in. For external motor controllers. Are the STEP/DIR pins and any other pins active HIGH or active LOW? Also is there a firmware build that has 4th axis control instead of mirror? Is the Protoneer RPI-cnc HAT based on an Arduino UNO yes or no? if it is then hay great, I have tons of arduino stuff. The nano board is on a totally different board so I dont know what to make of that statement. ""Those are pin grbl dont use??"" I have no idea what that means... What is the function of these 3, how are they being used? because they are only directly connected to the mega and nothing else, That being said then why are the via's on the board then if they are something not to touch etc... are they for software debugging? are those addresses being used in software? Plus i'm still wondering about the last question I posted asking about if the board with external drivers is active high or active low? is it 5v or 3.3v for active high? or is it -5v or -3.3v for active low? And is there a firmware build that has the 4th axis as indipendent control instead of mirror? I've read a number of post's but never found a firmware. or details on exactly how to get it done. Berin : Do you have your pi and protoneer hat up and running? Your pass though board is configured differently than mine. I think it knocked out my pi, it won’t do nothing. Your board says “ext. drivers only” on the top of the board, mine is on the bottom of the board, with the Dir, Step, Enable, GRD oriented the same way yours is.